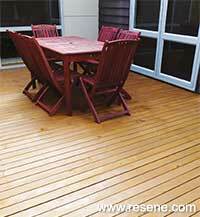 Mark Rayner gives a tired deck a brilliant new lease of life. You will need: bucket, garden sprayer, hose with clean running water, paintbrush, paint stirrer, Resene paint pot (for washing brush), a stiff-bristled brush, Resene Mineral Turpentine (for washing brush), Resene Moss & Mould Killer, Resene Timber and Deck Wash, Resene Woodsman Penetrating Oil Stain tinted to Resene Nutmeg. To get the look: Mark stained Mark stained the table and chairs with Resene Woodsman Wood Oil Stain tinted to Resene Japanese Maple. 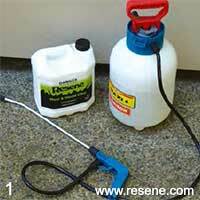 Mix one part Resene Moss & Mould Killer to five parts clean water and fill the garden sprayer with the diluted solution. 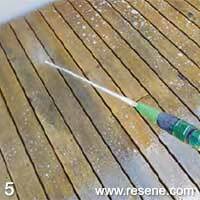 Spray the solution generously across the deck and leave for 48 hours. 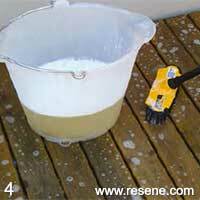 Mix one part Resene Timber and Deck Wash to three parts water. 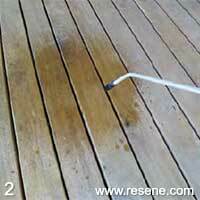 Scrub the solution vigorously across the deck using a stiff-bristled brush. Allow the wood to remain wet for 10 to 15 minutes. Rinse thoroughly with clean water and allow to dry. 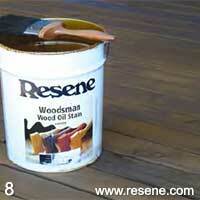 Carefully stir the Resene Woodsman Wood Oil Stain with a paint stirrer. 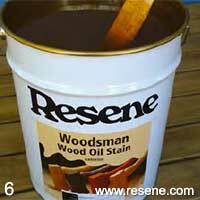 Apply one coat of Resene Woodsman Wood Oil Stain to the deck, brushing in the direction of the grain, and allow to dry for 24 hours. 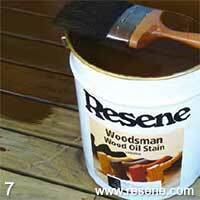 Apply a second coat of Resene Woodsman Wood Oil Stain to the deck, brushing in the direction of the grain. Again, allow 24 hours to dry. 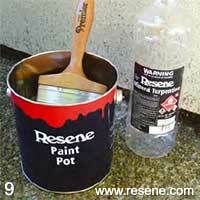 Clean the brush with Resene Mineral Turpentine.